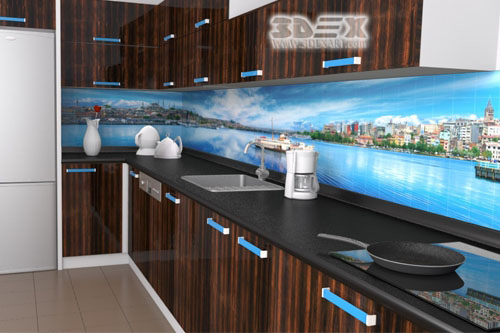 as any 3D design in any part of the home, 3D backsplash designs for kitchen enlarge the workspace of cooking and preparing food. 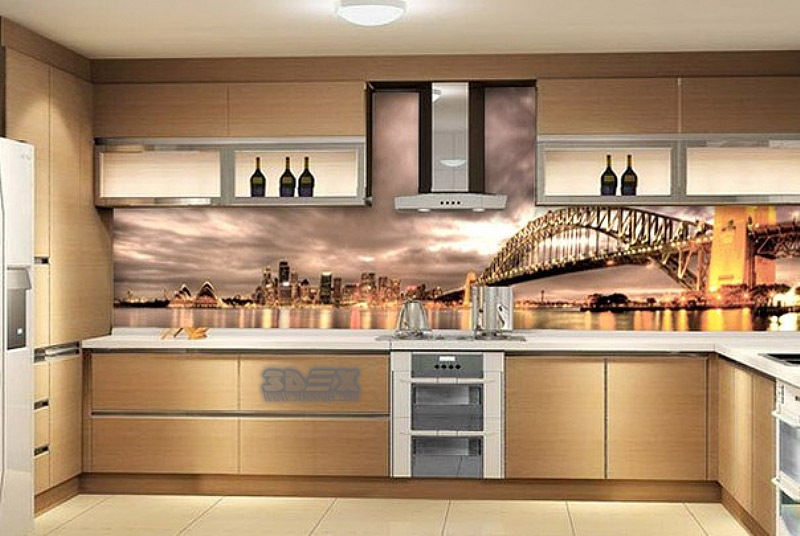 it's a smart solution for the small and tight kitchens that don't give the enough workspace for cooking and free moving into this room. 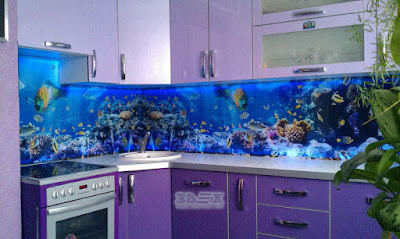 some of the designs we show today are specially made for this purpose as they give the feeling that you are working in a large or infinite space. 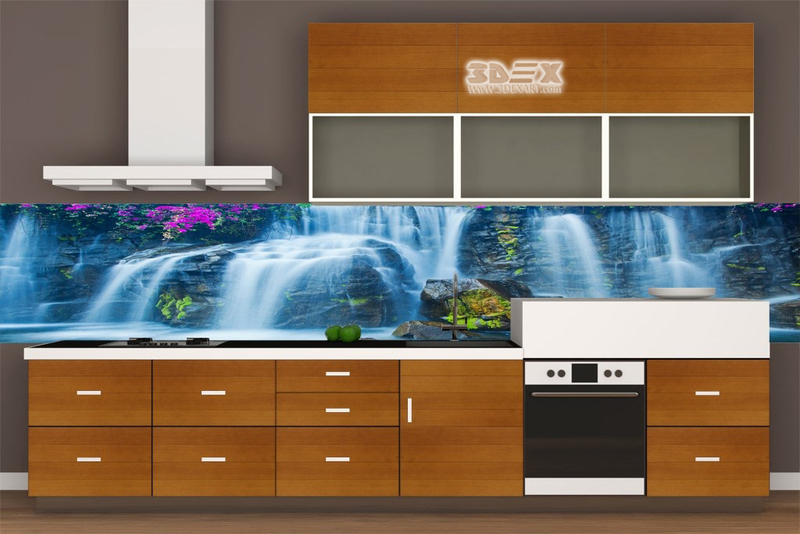 another advantage of the 3D kitchen backsplash panels is that enables you to choose from millions of designs the one you love and makes you in the mood, in this article we provide you with a collection of 20 designs for inspiration and helps you to choose the proper 3D backsplash mural that fits in your kitchen interior. Colors of the kitchen walls, designs of the floor tiles, a design of the false ceiling and colors of the furniture all are not enough to make an awesome modern design of your special kingdom in your home. 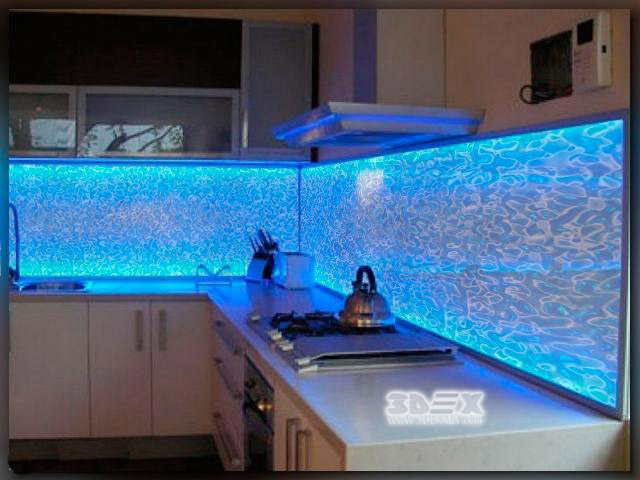 our 3D glass backsplash tiles are a great option to complete the fantastic view of your kitchen. the charming landscape image when you use it as a 3D backsplash design in your small kitchen, it adds volume to your tiny kitchen and make it visually larger than you feel before, the landscapes and the great views in our life will diffidently make you in the mood when you are in the boring time of cooking. 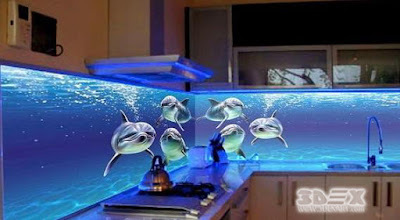 Using the images and murals of fruits and flowers as glass 3D backsplash design adds beauty and creates a healthy environment in the kitchen interior, there is no place in the home is as more suitable than the kitchen to use such figures, print a high quality image of your or your kid's favorite fruit to get a welcoming kitchen and involve your kids in their food preparation. 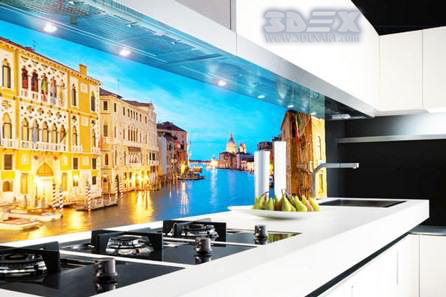 another option for choosing the image of the 3D kitchen backsplash on the glass panel is adding a city image, for city lovers, there is no need to explain why to opt for this option, but for all of us, having a city image with high buildings, wide streets and city lights will give you the feeling of cooking in an open-air kitchen in a Skyscanner in the 3D backsplash image. 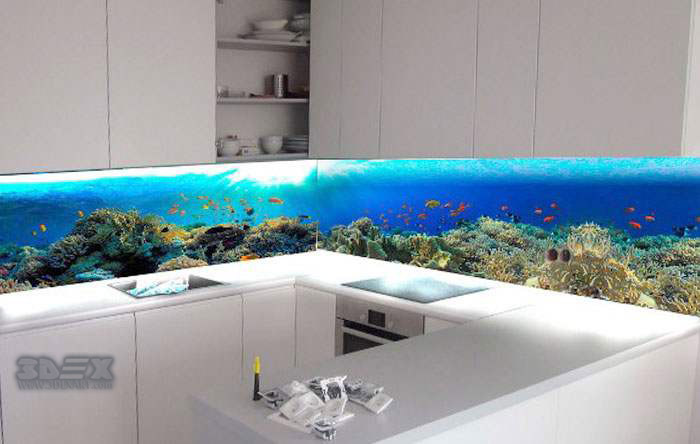 this option doesn't need photo printing or painting, the 3D feeling is really a not optical illusion, the volumetric pattern in the glass backsplash panel is highlighted with colored LED lighting that makes to create this awesome view. Now, how to install a glass 3D backsplash panel? now we arrived at the part of installing the glass panel for 3D backsplash design. for the glass panel, you have two options, the first is to print the high-quality image with the design you want, and then paste it to the high-quality glass panel to be ready to be installed on the kitchen backsplash. 1Put the 3d glass panel close to the kitchen backsplash. 2 Using a pencil or marker, mark the exact location of the holes for attaching the panel. 3 Drill the previously marked points. 4 In the prepared holes, put the wall fishers and then insert the plastic nails. 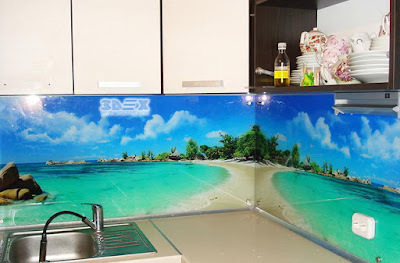 5 Fix the 3d backsplash glass panel (fasten with self-tapping screws). 6 Special caps are put on the self-tapping screws. 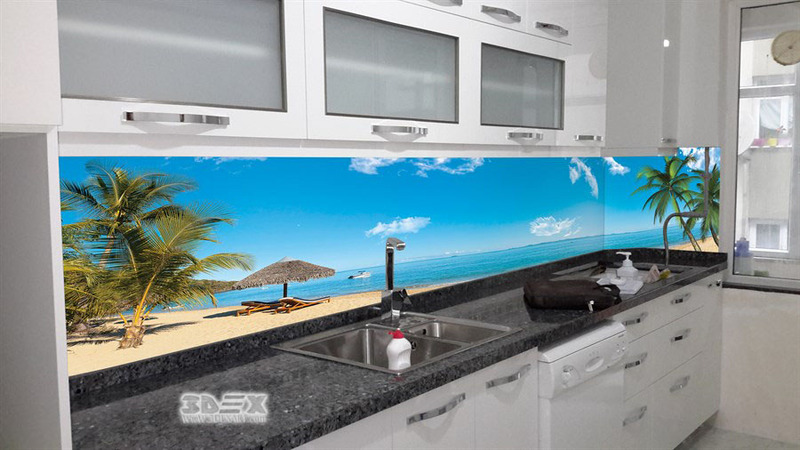 It is important to remember that when installing the 3D backsplash between a glass and a concrete wall, you need to use gaskets made of plastic. 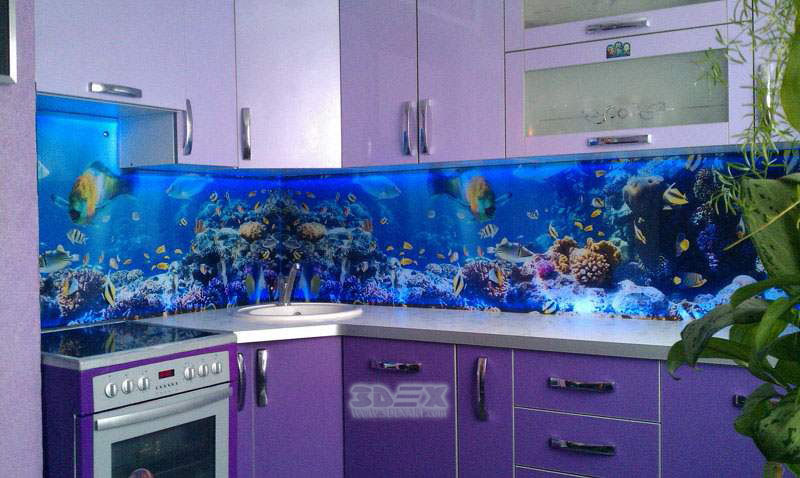 They protect the glass backsplash panels from contact with the wall surface. 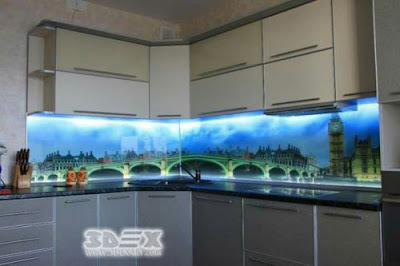 To ensure the feeling of the 3D scene in your kitchen backsplash, LED lights in the background of the glass panel will complete the 3D backsplash design and highlight the details in the printed image, the LED lights will ensure the reality in your 3D design that will help you get the desired result. 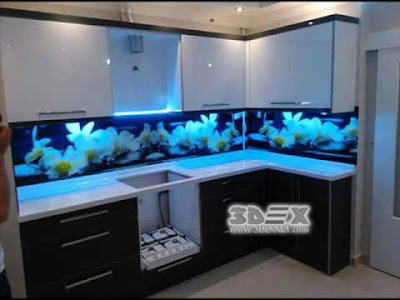 before installing the glass panel on the wall, install RGB LED light strip on the back perimeter of the glass panel, these strips have existed in all shops, Then install the glass panel as we mentioned before, when you are finished, turn on the LED strip and enjoy the great job you have done! According to more than 3 big shop and stores, the glass panel for 3D backsplash design with LED strip costs from 40:60 USD per square meter, this price including the high-quality glass panel, high-quality image printing on the glass panel, the LED strip and the installation tools.